The Modern Sky Festival, based out of China, coming to Seattle on October 11th, isn’t the first festival that organizer Michael LoJudice has helped put on. “I’ve worked for Modern Sky Entertainment for almost 10 years,” he recalls. “We are based in Beijing, with an office in New York. Prior to that, I worked in the music business in NY. “This is our first fest in Seattle,” LoJudice explains. “We produced Modern Sky Festival NYC last year in Central Park, and will again this year (a weekend before Seattle). 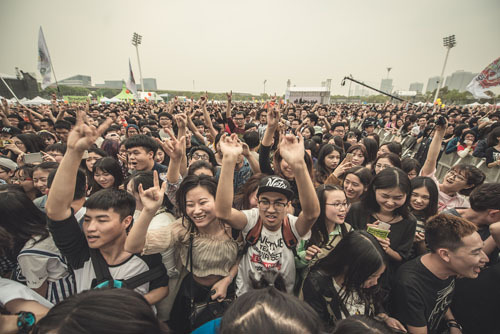 The Chinese acts at the Festival include New Pants, an electronic rock band active since the late ‘90s; a folk singer, Song Dongye; a hard-rock act, Miserable Faith; and Hedgehog, influenced by Nirvana and the Jesus and Mary Chain. It’s the first Seattle appearance for all of them, although New Pants have played United States dates before, notably at the Coachella Festival. Non-Chinese acts include long-running hard-hitting post-punkers the Gang of Four (no relation to China’s Gang of Four); garage-rockers the Black Lips; the gender-bending chillwave of Ariel Pink; and Ethiopian-Finnish singer Mirel Wagner. For more information on the Modern Sky Festival in Seattle on October 11th, visit http://modernskyfestivalseattle.com.